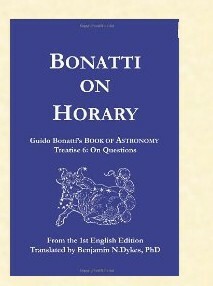 Renaissance Astrology: Book Recommendation: Bonatti "On Horary"
Book Recommendation: Bonatti "On Horary"
The 13th century Italian astrologer Guido Bonatti wrote one of the most important books of traditional astrology, the Liber Astronomiae literally the Book of Astronomy. This was the standard reference text for medieval and Renaissance (i.e. traditional) astrologers. The famous English 17th century astrologer William Lilly quotes almost directly from Bonatti in his famous Christian Astrology and Bonatti keeps popping up in almost all English traditional astrology texts. Originally written in Latin, finally this magisterial text of traditional astrology is available in English. Ben Dykes, the translator, has both a strong academic background (Ph.d in Philosophy) and is a practicing natal astrologer and graduate of Robert Zoller's excellent medieval natal astrology course. Dykes has done an excellent job of translating and commenting on the Liber Astronomiae. While the complete Liber Astronomiae contains an introduction to the basics of astrology, plus horary, electional, natal and mundane treatises, it often circulated in the Middle Ages and Renaissance in smaller subject sections. This is Bonatt's horary section. Definitely well worth getting for all students of horary astrology! Bonatti gives an excellent introduction to horary astrology which uses the time of a question, rather than the time of a birth chart. Bonatti then gives very detailed instructions for determining questions for each of the 12 houses. All traditional horary astrologers need a copy of both Lilly's Christian Astrology and Bonatti's Liber Astronomiae. With the complete hardcover edition out of print, I am glad the paperback edition of Bonatti "On Horary" is so easily available! You can order Guido Bonatti's "On Horary" on Amazon.